anyway thanks for you work translating this novel. Does anyone know what chapter Paracelsus fought Bryn and Arthur? Drama CD 3 date changed to September 26th. Jesus christ lol. You might as well stretch it to next year. Last edited by SmartCable; June 1st, 2018 at 12:54 AM. Here is the completed translation of Fate/Prototype: Fragments of Sky Silver - Arc 1: Little Lady Arc - Act 6 - Part One. There's only the bonus act "Servants" for Volume 1 left. Warning: Part 1-C might be a little bit emotional and traumatic since it's little Ayaka's memory of Saber killing Manaka. A memory of the morning when I last saw that person’s figure. As she said it, Big Sis was trying to go out without carrying anything. There’s already no sign of Papa. Although she didn’t exactly understand it, Ayaka Sajyou faintly thinks, ‘She’s definitely not coming back home after last night.’ There were just too many secrets about the ritual that her father and big sister were said to be participating in, that the young Ayaka just didn’t know about. After all, I’m different from Big Sis. My big sister ―――Manaka Sajyou. Just by walking through the corridor and walking the distance to the front entrance like this, right, everything about her is different. The morning sun which shines in through the window, glitters, as its radiance sprinkles over Big Sis’ whole body. It’s as if she’s something more precious than that, like a fairy or princess from a fairy tale. Even among the picture books which my father had read to me only a few times just before going up to elementary school, there was never a person who shines as much as this, there wasn’t even one among the foreign animation films that I had watched several times by myself. She’s just too different, from me. Or a mediocre person, maybe? ‘Such words suit me,’ Ayaka thinks. Right, it’s the word that I had just learned in my elementary school’s Japanese Language Class. Ordinary. Despite it being a word that I should’ve already known ―――― having listened to the explanation from the teacher’s mouth and having watched the sentence being written on the blackboard in white chalk, ‘Aah, I see, so that’s how it is,’ I had thought. ―――My Big Sis who can master anything. ―――Even one of the black magics, that I myself is far from mastering. At around the age of eight, the same as myself, Big Sis was said to have perfectly mastered two types of our family line’s sorcery without even a little bit of help. Ayaka who had listened to that story while her eyes were lighting up, unintentionally let slipped, “I wonder if I’m able to do that too?” out of her mouth. Was it about last year, or a little before that? I was depressed as soon as I thought that, I was sad, miserable, I couldn’t sleep, I also lost my sense of time, I was even more than 20 minutes late time-wise to go out for my daily morning chores. However, I immediately realized that it’s not the case. I completely realized it. At the same time, I, myself, was no more than a child from a very ordinary and average Magus family lineage. “To master the magic of one’s family line,’ is simple to say in words. But actually, by properly inheriting a family line’s magic circuits which have been engraved into our blood, one can learn an entire lifetime’s worth of knowledge, study it, and somehow is a good place to be able to master one’s lineage. That is normal. That is, my average style of black magic. ―――Even if I think that I want to be……. That is, probably because I’ve already decided that it’s hopeless. It’s somehow better to think that way. So, I won’t think it this morning either. My so much prettier big sister, is a radiant person. Even as I witness the brilliant soul of the one called Manaka Sajyou who is proceeding down the hallway while twirling around and around, while basking in the shining sunlight, I won’t think ‘if I became like this,’ or ‘I want to be a wonderful woman,’ I won’t think about such things. I, absolutely won’t think them. I can’t think like that. Like looking at the birds dancing in the sky, or the bugs crawling on the earth. Like the many Magi, who yearn for the root of all creation. Sighing, I mumble her name. Already, the huge door to the foyer appeared before my eyes. If I pass through here, Big Sis will tell me that she won’t be coming back home for a while. Naturally I opened my lips. My voice. The words, however small slipped out. Spinning, Big Sis turns around to me. As she turns her back to the huge wooden front door of the Sajyou house. That figure, in some respects, also appears similar to Alice from the fairy tale, where she took a journey into a Wonderland that was filled with strange and miraculous things. “Tilt your head,” Big Sis said. A pretty sound like the ringing of a bell. Her voice. With a much smaller voice, I look down. Have I maybe told a lie before? But, I think I’m definitely lonely. What I’m feeling is real. I’m lonely. It’s lonely, being alone in a huge house. Especially, when there aren’t so many times when the two of us are together even when Big Sis stays at home, before this magic ritual―――the Holy Grail War began, I felt that it wasn’t necessarily enough for me to just face her even at meal times. Even so, I think I’m lonely. The someone somewhere in my house, my big sister is here, my father is here. If I’m alone without meeting anyone on top of that, then when I’m really alone with nobody here, I see, I have a feeling that it’ll be different. As she looked up at her Big Sister, Ayaka went completely silent. Even if I’m lonely, I can’t say, “Stay here with me,” can I? I wouldn’t allow it to begin with. For my Big Sis who is going out to do an important ritual, I’ll restrain myself, somewhat. Big Sis’ hand reaches out, touching Ayaka’s head. As she says it, she strokes my hair. Despite thinking that it’s a first for her to be doing something like that, why, do I feel a familiar presence in the way that Sis is using her hands, suddenly, my neck tilts. ―――See. She’s like a princess. ―――Big Sis who is saying that, is more prettier, than anything, or anyone too. To long for someone. Love. ‘Certainly, it’s a beautiful word,’ I think. With a voice which uttered so much from dazzling Big Sis’ lips, her words, were shining more intensely than the radiance of the sun flowing in through the window, with an “Aah, it’s wonderful,” Ayaka was overwhelmed by them. It’s just that, her words, and the radiance brought from her smile is so overwhelming, that I can’t possibly consider nor think of anything else. To fall in love, she said. Love. The thing is, even if I know it as a word, I haven’t actually felt it before. ―――While I was listening, to her pretty voice. ――――――My eyes. I fully avert them. ―――I can’t stand Big Sis’ radiance anymore. Sparkling, Big Sis tells me this while wearing a glow. Normally I was supposed to be captivated by it. However, for some reason, why do I have this indescribable grey haze swirling around in my chest? Why, am I the one averting my eyes? It's because, the entirety of Big Sis who shines so much is way too dazzling. Or, have I been feeling something else? Why, why am I feeling so anxious, in front of this person who is radiating so much? Her life? Sacrifice it? Yes, spoken from this person’s mouth? ―――Looking down. The words leak out. ―――Still with my eyes cast down. ―――Like a prayer, it’s a request, to my Big Sis. “Drip, drip,” tears are falling as I tell her these words. Without raising my head while still unaware that this is the last moment between us, without facing her gaze properly. That’s why, Ayaka didn’t realise it. That in her next words. More precisely, in that small instance when Manaka Sajyou replies back to her words, in that tiny moment, what on earth had happened? The glimpse of her which she had believed to have seen till now, at that moment, was accompanied by a clear figure, but to Ayaka it was right there. ―――The pretty echo, the sound….. Of her voice. ―――A voice clad in mystery. ―――Gently, reaches me as if I’m being hugged, by Big Sis’ words. As Big Sis tells me this, what kind of face was she making? As Big Sis said it to me, with what eyes was she looking at me with? Ayaka Sajyou hadn’t realised it. It’s about the end of it. The Holy Grail activates by burning the lives of seven Servants. On top of the structure, only one Master can become the victor, an outcome in another form is something that you couldn’t originally get. But if you disregard the outcome of it, then a different form of conclusion is also possible. In other words, a case where all of the Masters are either defeated in the Holy Grail War or have chosen to resign their right to participate. We magi who seek the root of all creation, have a very low likelihood of requesting a personal abstention during this Holy Grail War which is the greatest of opportunities for us, but I will speak only of that possibility here. In lots of cases, it is likely accompanied by the death of a Magus. As described in a separate heading. This, is established by announcing it to the Overseer that’s dispatched from the Holy Church. The result is either an elimination or a waiver of their rights. If by chance, there’s a case where the number of Masters become zero. Without our great ambition being fulfilled, we will wait for our next opportunity. A memory of myself from 8 years ago, when I saw that person’s figure for the last time. That was only a temporary parting. Because the real last time came soon after that. I can’t remember it all except for in fragments now, but there is one memory that I don’t want to remember. An important magic ritual. The mutual slaughter of 8 years ago. Performed through the joined hands of the Mage’s Association and the Holy Church, the very first Holy Grail War. My memory is vague, sometimes, yes, so these scraps of the last time might also be a good place to start. Although, I believe I have recalled it to someone before. See, even I can arbitrarily fully recall it like this. Oh, I wish, that I didn’t have to see such dreams. Though, such a meagre wish of mine will not be granted. For the merciless Hypnos, is forcibly showing these memory fragments to me like this. The first one is of my memory of that early morning, 8 years ago. My farewell with that person. The last one is of my memory of their demise, 8 years ago. It is the real one, the real moment of Manaka Big Sis’ and my parting. ―――In the dark, dark, deep underground of Tokyo. In a three-dimensional magic circle. Something black, is drifting in the Greater Grail. Standing in a line are sacrifices. A countless number of girls, falling in order. Ordinary, plain, lives that are just going to being consumed. A life. A life. That's probably, right, that’s, I think that’s my father’s laughing voice. I know, that someone’s voice. The voice of my Papa shouting. I hate it, stop it, Papa. Stop it! Why? Why are you saying, those things? Why, why are you shouting like that!? Let go of me! It hurts! I hate it! I hate it! Am I, going to fall too? Over there? And then, my consciousness spins and blacks out together with my despair. What I noticed, was after I felt something had covered my face. Right, I, open my closed eyelids. Like she’s even protecting me, is standing dead still. Could I…...have said something, at that time? I might not have been able to say it. Because, I realised what the thing covering my face was. Covering my face, is Big Sis’ blood. My older sister who stood right there in front of my eyes. A pretty person. You, who shined more than anyone, like a princess. Something, something is bulging from her chest. That, that thing pierced through the pretty black feather pattern on her chest, is a golden blade. She’s been pierced by someone’s sword from behind, Manaka Big Sis. Last edited by PhoenixRising; July 14th, 2018 at 11:58 AM. Manaka is so uncaringly evil and I love it. Here is the completed translation of Fate/Prototype: Fragments of Sky Silver - Arc 1: Little Lady Arc - Act 6 - Part Two. The light of the dazzling sun, shines in through the gap of the closed curtains. The voices of songbirds tell the time, while perching on the branches of the trees right beyond the window. While rubbing her heavy eyelids, in her soft bed, Ayaka Sajyou wakes up. Waking up was the worst. Why, because she had a cruel dream. Although the contents of it are fragmentary and she doesn’t really remember them, she only knows that the memory of that moment, 8 years ago, appeared to her as dreams. While mumbling it in her mind, she stretches out her hand to the digital alarm clock that was placed on her bedside. As her right hand came out from the blanket, a chilly air touches it. Yes, even the comfortable feeling of her bed which regulated her own body temperature, or even the light of the morning sun, she likes them just the same as those songbirds’ voices. Even so, cold things are cold. Although she is driven by the temptation to want to curl her entire body up in her blanket and fall asleep again, she somehow endures it. She brings the digital alarm clock closer to her eyes. Although the part about normally spending her everyday life even without glasses didn’t trouble her very much, with eyes which had become worsened as they were in these eight years, it was hard for her to see the items on hand without wearing glasses. After all she is near-sighted. After turning a fleeting gaze towards the western calendar display like always, she checks the time. It is not a particularly uncommon time for her classmates who have morning club practice for instance. However, Ayaka didn’t belong to any club, so this time is definitely the time when she must get out of bed. As she mumbles it, she turns the alarm switch off. The time that the alarm was setup for is 6:00 AM. So, “perfect.” She had to quickly get out of bed. Wriggling and crawling out from her blanket, she squirms to takes off her pyjamas. She then puts on her high school uniform which she had laid out before she went to sleep last night, puts on her glasses which she had left on the top of her desk, and then combs her hair in front of the full-length mirror that was beside her wardrobe. Since her hair is not really that long, she finishes it right away. It’s okay. At least, it didn’t affect her breakfast time. The air in the corridor, was even more colder than the inside of her room. Walking to the bathroom at a fast pace, she washes her face with water that was so cold that the air didn’t bother her at all. Naturally, she fixes her fringe in place with a pin so that it doesn’t get wet. It’s cold. Surprised, she lets out a cry. Suddenly, it catches her eyes. The small stepladder which she cannot use now. After muttering it and sighing, she looks at the mirror. Naturally. Her own appearance, was reflected in there. She didn’t even wet her bangs, so it’s her 16-year-old self. The words were naturally spilling out. A girl who wore glasses. A girl, who didn’t stand out or seem to fit in anywhere, is in there. She might not solely resemble that person, or even have her clear eyes which should shine by catching the light, but they didn’t attractively shine through the lens of her glasses. ‘Yes,’ Ayaka thought. It was a face that couldn’t be said to be in, her group of favorite things. Before her own reflection in the mirror, she wondered why the expression in her eyes were so full of caution. It might be oozing out of her character. Rushing, she walks through the corridor and opens the door to the dining room, passing through it to go to the kitchen. Although he says that doesn’t mind the ‘person on duty system’ for cooking, she wanted to make it by herself as much as possible, after the unbelievable amount that he made the last time she entrusted him with it. Although she didn’t particularly mind having to eat lots of food, it would be bothersome to naturally come up with something if she has to eat the same amount of food as him. Fetching some vegetables from the refrigerator with her fingers which still had the bandage from yesterday wound around it, she grasps the kitchen knife, and begins with the tomatoes. With a tap-tap, she starts cutting them up. It was after elementary school when she had noticed, that even one style of cutting changes the texture of the food, directly connecting it to taste. To that end, she couldn’t really puff her chest at it. Despite being able to prepare mainly vegetables, it had taken a considerable amount of time for her to realize it. Despite not wanting to be surprised at this moment, “Wah!” she cried. She was surprised. As she turns her gaze, he, appeared there. ―――He who had blue eyes, that appear green with the addition of light. He smiles as he says it. It was his usual, smiling face. It was definitely an illusion, but the sunlight that was shining in from the window, felt like it was sparkling and shining, wrapping around him as if he was being blessed. It didn’t mean that he was emanating magical power, or that he was even a prince from inside a picture book. Somehow, she slightly says it while forming a calm voice. Quickly she makes the breakfast. In the Fresh Vegetable Salad, are Sunny Side-Up Fried Eggs. As well as toast. Sausages which were also prepared because he came up to her and asked, “Don’t you have any meat?” are also fried. Meat, stuff that comes from the bodies of living beings are no good to her. She can’t stand it. Blood too. So, sausages. The feel of the meat, the non-impression of blood, ready-made stuff, she couldn’t handle those kinds of meats unless it was this style of processed food. She can only say, that she is disqualified as a Black Magus. The bandage that was wrapped around a finger on her left hand was good proof of it. Although Ayaka thinks that she’s pitiful, there was just no helping it on this. Without deliberately answering it, she begins to try and set the dining room table. And, as if she was anticipating it, he had done it in a blink of an eye. He did all the rest to the extent, that Ayaka came in carrying the cups and milk that was taken out from the fridge. Despite not being aware of it. Ayaka exhales a sigh in her thoughts. In her usual habit, she had yet again, made Sunny Side-up Fried Eggs. She, didn’t say anything. In any case, he whose place is as the most excellent Servant, knew what Ayaka didn’t want to say. Was it because he had a magical connection with his Master, no that is not the case, he is just merely perceptive. Without batting her eyes to him, Ayaka nods. She whispers in her mind. Like she was trying to avoid his perception, quietly. Although Turnover eggs are really her favourite, no, although it was, now, she’s not really sure whether that’s the case anymore. After all she had continued to make the Sunny Side-Up Fried Eggs which her big sister had always liked. In the first place, she liked Turnover eggs when she was younger, so she might’ve discovered her tastes with her modest rebellious spirit towards her big sister who was perfect. Without knowing it, Ayaka was looking out the window. 8 years ago. It was as if she was dancing around and around, in that spot where that person was basking in the morning sun. ‘That’s probably, all that it is,’ Ayaka thinks to herself. Was it because she had hated to continue her meal in still silence, or that it might even be better for her to hear a lot or even a little bit of information about the Holy Grail War, a couple of reasons come to her mind. But, the most closest one, is that she thinks she’s curious. Cause she had suddenly become bothered about it. She still spoke of it at any rate. She was feeling, hooked on his words. She completely tilts her head. 8 years ago, he was also participating in the Holy Grail War. It didn’t appear like there was something wrong with him. He, was a flawless person. A person? No, a Heroic Spirit. Nestling close to herself who is the lowest of the seven ranked Masters – Princes, he is the first ranked Servant, who had sworn to fight alongside her in this Holy Grail War. Even though it should’ve been that, now, for just a brief moment. There’s somehow, a seemingly sad, apologetic, almost unpleasant weird look on his face. Indeed, it’s like its being suspended on his face? A person who shone more than anyone else. A person who ran through the Holy Grail War of eight years ago, alongside Saber. The me of that time was still young, so there are a lot of things that I can’t remember now, but, I can definitely remember some things. My older sister who was able to do anything well, no, my big sister. A pretty person. My Big Sis Manaka. Along with my father, she was a person, who was surely kind to me. To the me, who is ordinary and incapable of anything. I say it, once more. While praying, that I wasn’t making an awkward face. Needless concerns. Well, I hope that’s all they are. Right, they’re probably nothing more than needless concerns. All of the entries jotted down in this notebook do not mean a thing. Because a Second Holy Grail War will never be held again. Regardless of whom the victor is, my family lineage will never be involved in the Holy Grail War again. The miracle of the Holy Grail will not happen again. Someone alone will reach the root without fail. With that, it’s the end. But. If by any chance. If it comes to be, then are the words that the Overseer let slip to me the other day the truth? And then, the girl reaches Garden. Taking in lots of the morning sun, are the glass walls and ceiling. In the center of its radiance, she looks at the flock of pigeons who are swarming at her feet, while she thinks about the existence of the bandage that’s wrapped around her own finger; she gently gathers one of the birds into her arms. The girl thinks on the past. There are not many things that she can remember anymore, her memories of 8 years ago for one. Her memories of her older sister. Her memories of her father. The girl contemplates on a few things. There were only two things that she could remember in fragments. She has no memories, about her mother. The voice of a young man who she had gotten used to hearing resounds. Immediately close to the glass door of Garden’s entryway, was the figure of him. Due to the shining sunlight, even if shadows were to fall on his face, the girl knows his expressions well. He is, surely smiling. Even now. Gently releasing, the pigeon that she carried in her arms. The girl nods straight, at he who had green eyes. ―――And then, I will walk. Towards the Second Holy Grail War being held in this Tokyo again. Last edited by PhoenixRising; July 14th, 2018 at 01:00 PM. Growing up next to psychotic perfection scars a girl, who knew. Hmm I wonder when does this take place during Prototype? The two of them seems to stopped pickering each other here, so perhaps perhaps somewhere mid way after Perseus? Ayaka doesnt remember anything about her mom, Manaka doesn't talk about it much, wonder what's the significant hint here. Probably, the last scene seems to be set a day after their first major battle. About the other statement, Ayaka was only about 3 when her mother died, so naturally she doesn't remember a lot about her. Her father was also so very saddened and hurt by his wife's death that he threw himself into his mage work, so I imagine that he didn't talk a lot to Ayaka about her mother because it would hurt too much. As for Manaka, while she may've been saddened by her mother's death enough not to talk about her, I think she either might not have felt anything about it or that her omnipotence kicked in blocking her emotional response making her twisted and unfeeling after it. I'm not really sure about this part. -She's british and that Manaka resembles her. So she perhaps had blonde hair. -She died from some disease some time after Ayaka was born because she had always had a weak body. *There's also some secret about Garden that Hiroki (Ayaka's father) told Ayaka about, which we don't know about yet and probably won't find out unless Sakurai writes Fate/Protoype Light Novel series or an anime is made. I wonder how much conception of the main characters has changed between the 2012 Prototype and Sakurai's Fragment. I think Ayaka and Manaka's mother being British is Nasu's idea since the blonde hair and blue eyes features dated back in Prototype (not taking the red head yellow eyes Shirou for granted lol.) In addition, Ayaka's design in the old fate character sheet shows that she doesnt have blue eyes until prototype. I could be wrong but this series is now mostly under Sakurai authorship after all. Whatever it is, I hope it clear up the whole Manaka being chosen as omnipotent. It's either the relic which he gave her draws birds toward her, or him watching out for her. I believe this is mentioned in FGO London interlude too. Good read. 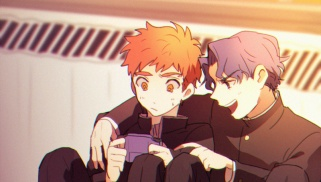 Course all I could think about was Cu's connection to Ayaka instead of Arthur. Also I'm like, 95% sure that the relic Ayaka has is Avalon which makes your theory very interesting. Waver mentions the connection the goddess Morrigan has with ravens and the association Morrigan has with Morgan. Maybe Ayaka inherited through her mother some distant connection/affinity with Morgan's line of magecraft. If i recall from fragment, there were multiple times Arthur compares Morganna to Manaka too. I dont really know if Case Files world coordinate with Prototype, but Sakurai is evidently throwing vague hint of Fairies associated with the Sajyou families. If it was the old fate, then I would be completely convinced that it is Avalon. I still do now, but when I think about it does Arthur lose his scabbard in his timeline like Artoria did? So the relic he gave her could be something else. However without Avalon, how could Ayaka beat Manaka without it to purify her black mud, or even save Arthur from being corrupted? In any case, it'll be a long wait for the answer. Last edited by SmartCable; June 12th, 2018 at 01:36 PM. I mean, I'm assuming that Avalon is what he gave Hiroki to protect Ayaka so that she could summon him next war. I'll have to re-read to see if it's mentioned specifically or if it was vague. It's not mentioned. All Fragments mentions is that Hiroki gave Saber the catalyst that he used. It's intentionally being kept vague, so I imagine that the reveal is a story climax point in Fate/Prototype. In that case it should be Avalon. An Avalon that can do something different than Artoria's Avalon, yeah. I don't know Arthurian myths so I have no idea what else it could be lol. Of course, it needs 5 conditions unlocked to be usable. It could be the dagger, the other weapon bestow to him from god, but do I hope it's Avalon so that it can rehash this phrase from S/N in a new awkward light.